1.3 Where can I buy? All LUCID mattresses are updated with a new feature – CertiPUR-US. You can find the logo on the image. LUCID is going to tell us their mattresses pass the CertiPUR-US test and contain no nasty material. That means LUCID 12” gel foam bed is safe and no harm to your health. 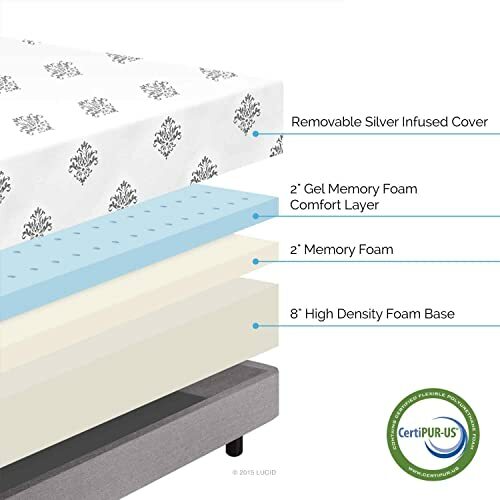 Besides, the durability of the CertiPUR-US certified bed has been tested and approved. The program also has a strict standard for outgassing. The bed passed test has less emission than other ones. Here is a bad news concerned about 25-year warranty. I know some of you connect warranty with replacement, refund or something. The truth is the warranty only covers manufacturer defects and body impression over 1.5 inches. Don‘t take it seriously. LUCID 12-inch gel memory foam mattressis a high customer rating mattress, which is above the average customer satisfaction. There are three main features owners mentioned most, best price, no heat issue and comfortable sleep. A key reason why this LUCID 12-inch gel memory foam gets popular among customers is its super low price. It’s only 1/7 the name brand. If you read owner reviews, you will find no one complain sleeping hot and they only mentioned they had no issue with heat. Although many owners said it was soft, it is still at the firm end of all LUCID mattress. Due to its medium density, it is a back pain relief and provides the needed support for every pressure point. As for the price, LUCID gives this 12-inch mattress a reasonable price that most people can afford. This mattress is a little on the firm side compared to other LUCID mattresses. However, it is not an ideal choice for people who need a really firm foam mattress. That said, it’s firm and more supportive. 2 inches gel foam plus 2 inches comfort foam improve its breathability and create contour support for your back. Note: if you are comparing this mattress with Sleep Innovations mattress, it’s a softer bed. This LUCID 12-inch mattress has dual comfort layers as the previous model. The top is 2-inch 4lb gel memory foam and the center is a 3lb standard memory foam. If you’ve never slept on a memory foam mattress, you may feel very weird sleeping on the bed and can’t fall asleep easily. It does take some time to get used to and after that you will feel like sleeping on a cloud. Some owner told it took him a week to adpat to his new bed. Besides sleepers especially heavy people will find it very soft and supportive because the 4-inch memory foam can conform to the whole body perfectly. Over 80% owners mentioned their back pain improved dramatically. Most people can’t tell how the mattress works and effects but they feel “a world of difference”. LUCID 12 inch mattress uses the 4lb and 3lb memory foams, which are very helpful for bad back. Such decent density memory foams soften the pressure points and give needed support. It helps put the whole body at the right place. So some customers mentioned they didn’t wake up many times through the night to change positions and got rested and pain free in the morning. None of all customers told sleeping hot issue that was usually found on memory foam mattresses. What they mentioned a lot is that they have no issue with heat. That said, gel foam and open cell feature work great. This mattress is an upgrade version of the old version. It adopts gel memory foam as the top layer and pin-core technology. LUCID adds these two new features that the previous version doesn’t have to lower the temperature on the bed. The fact proves that it is a cool mattress as no owner feels hot. LUCID 12 inch mattress is also good at limiting motion delivery. It does reduce the delivery of the movements you made to your partner. If your husband or wife is a light sleeper, you don’t need to worry he or she wakes up when you get out of bed. It is because they hardly feel your movement. Too soft or too firm: some people complained it was too soft, while some other told it was a rock. According to most owners, it’s not too firm or soft. People weigh too much will find it too soft and others under average weight will feel too soft. If you want to buy a firm bed, this one may be not best suited for you. A chemical odor: Among all negative feedback, the most poular topic is odor. But it’s not a deal breaker. The odor dissipates very quickly and is gone in less than a week. FYI: This 12-inch mattress has two versions: Gel Memory Foam and Standard Memory Foam.